Q: What are the drop-off and pick-up times? A: Drop-off times depends on your scheduled event time and the number of products you rent. Pick-up times are an hour after your event is schedule unless asked for an extension. Q: Is the delivery and set-up time part of the rental time frame? A: No, the delivery and set-up does not take away any of your rental time. Q: How long is the average rental? A: Rentals can be for a full day, the weekend (check rental list for extra fees), or the usual 4 to 6 hours (depending on the time of your party or event). Q: What are the bounce house rules? A: An adult must be present at all times. Shoes, food, candy, drinks, crayons, markers, pens, or silly string are NOT allowed inside the bounce houses, inflatables, or games. 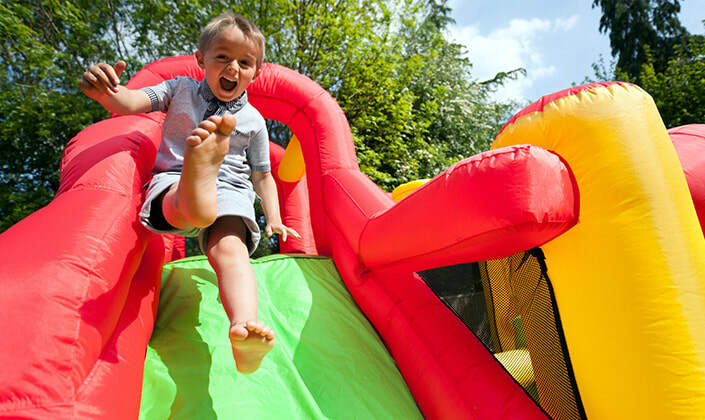 Q: How much notice is required to rent a bounce house, slide, or game? A: At least 48 hours is required for any rental; however, the further out you make your reservation the better the chance you'll get the exact product you want. Q: What kind of surface and how much room is needed? A: It is best to have a level surface with grass and with little to no trees; however, inflatables can be set up on concrete, pavement, sand, or mulched surfaces. The amount of room needed varies, but on average 20' by 20' space is enough. Q: What is your rain policy? A: It is your responsibility to watch out for the weather and notify us prior to your event. You reserve the right to cancel/postpone a scheduled event for safety reasons (rain, severe thunderstorms, hail, winds in excess of fifteen (15) mph, tropical depression, tropical storms, hurricanes, or tornado conditions) and you will be issued a full refund for payments received. If you fail to notify us of severe weather conditions prior to delivery, we reserve the right to not refund any payments. Q: Where in Ga do you deliver? A: We deliver to Carrollton, Villa Rica, Temple, Bremen, Bowdon, Dallas, Douglasville, Hiram, Winston, Lithia Springs, Newnan, Jonesboro, Tallapoosa, Stone Mountain, Marietta, and Acworth, . If your city isn't listed call and check for additional delivery services. If your location is more then 50 miles out additional fees will apply. Q: Can you refuse services upon delivery? A: We can refuse your services upon delivery if your neighborhood or location doesn't look safe enough for our products. If your yard or location isn't big or leveled enough for our products. Give us a call @ (678)-952-6880 with your questions & Check us out on Facebook @ Unique Family Events!